On the first morning in Morocco my kids looked out of the window. “Everything is red!” they were shouting. Indeed, all the houses were red, the sand was red, magical…. Morocco, one of the best examples of geographical diversity. 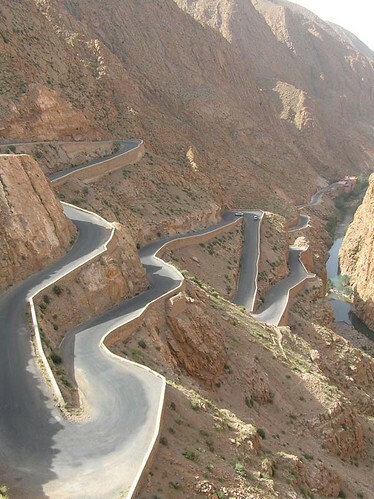 Landscape of mountains, plains, dessert and oases, Morocco is still undiscovered territory for many travelers. The country is also home to a diversity of cultures: African, Islamic, Arab and European. You might think that it’s not the most ideal place to travel with children. On the contrary, Morocco is one of the best destinations for you and your kids! OK, I admit, in the beginning I also had some fears. It was the first time traveling with kids aged 4 and 6 years and Morocco is such a totally different world. But after reading my story you will be rest assured: Morocco is great and people are so friendly: go there with your kids! Wander through Aït Benhaddou, location of great Hollywood movies. Visit Marrakech with its famous Djemaa El Fna square and horse carriages. 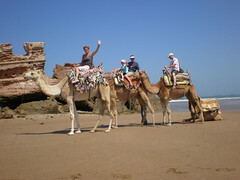 Watch the fishing boats return from their sea trips at Essaouira and go for a beach ride on a camel! Don’t try traveling the whole country, focus on a specific region like we did (from Ouarzazate to Marrakech, ending up at the Atlantic coast in Essaouira). Our travel starts in Ouarzazate, in the middle of the country, 200kms east from Marrakech. This is the threshold of the mighty Sahara desert. When we drive out of the city, our children keep gazing at the landscape: a combination of Monument Valley, the moon and the Sahara. This is absolutely not like home! After a beautiful drive along oases and kasbahs, we arrive at the ancient town of Aït Benhaddou. This is Unesco World Heritage and the place were movies like Lawrence of Arabia, Gladiator and Alexander have been shot. The town is build against a hill. The beautiful thing with children is to wander around its small and narrow streets. People actually still live here, so you can watch daily life. Play hide and seek and have fun! Don’t forget to climb all the way to the top of the hill. The view is really breathtaking! Give your children their own bottle of water, they need to learn to be responsible for drinking enough water. Obvious, but important in these parts of the country. After a long day in the desert, children need to cool down and play of course. Book hotels with a swimming pool. Wash away the dust and have fun! Also, when driving, take your time, get out of your car and let the landscape have its impact on you and your children. Marrakech is a city of taxis (petit taxis!). Let the children wave them down, they love it! Make sure that on the way back to your hotel, you step in one of the many horse carriages. Riding in open air you can smell the city (yes, that’s part of the experience as well!). There is so much to see in Marrakech: the Medina with all its shops and handicraft and the Djeema El Fna square with artists and musicians. The square really comes to life at night when it turns to one big open air restaurant! A great sight seeing tip is Ben Youssef Medersa Islamic School. 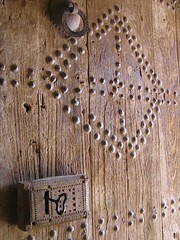 Beautiful architecture, described in my post on this Hidden Treasure of Marrakech. Visit the Majorelle Gardens, a truly peaceful haven in this busy city. Your children can really come to rest here. Don’t forget to drink your Moroccan tea! Marrakech is also famous for its white storks. We were surprised how many storks nested in the middle of the city. The children counted more than 30 when we paused for a drink! After the desert and the big city of Marrakech we traveled to the Atlantic coast (only a 3-hour drive). 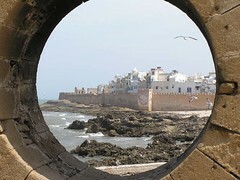 We spent our final days in the fishing town of Essaouira of which the Medina is also listed as an Unesco World Heritage. That’s all excitement! 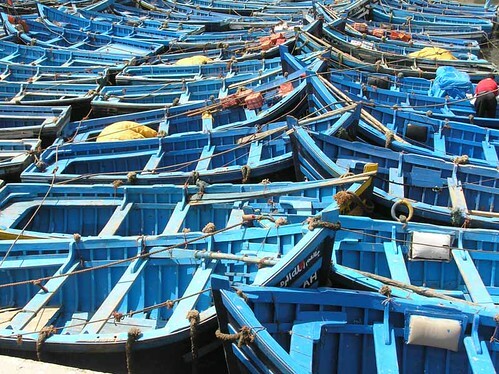 In the town of Essaouira, sea-gulls are screaming while fishing boats find their place on the quayside and fishermen call out for help carrying fish (and of course claiming to have caught the best fish of the day!). Children love it! They watched tons of fish being unloaded and even posed on a picture with their Fisherman’s Friends! My youngest son thought it somewhat scary at first, but after a couple of minutes you enjoy the waves of the sea, the salty smell, the sun on your skin and the endless, empty beach, all from the back of your own camel! What a great experience! People everywhere in Morocco are so friendly. And I have to admit, when you travel with children doors open that normally stay closed. People love children, everywhere. Bringing your children to people’s home country is seen as a compliment. This story was first published in March 2010 as a guest post on Cumidanciki.com. Thanks to Mei for supporting me and providing me that very first opportunity to write about my travel experiences. On 11 October this post has been promoted to Freshly Pressed on WordPress.com.